This entry is getting long enough that some are having difficulties loading it. I have continued updates on this post. Including her return home. So as to be able to provide updated information to those interested in the case involving the Busekros family and not overwhelm my blog with entries dealing with this situation, I hereby declare this entry my official update form. I will keep the most recent information on top. I may also include links at the bottom of others discussing the topic as I come across them. Feel free to leave any comments or questions! And now to contemplate what to do with this entry. It is unlikely to get a great deal of new information about Melissa in the near future. I could continue to provide updates to the situation in Germany as a whole, or perhaps set aside a separate entry for that. I'm not sure, but I'll let you know when I decide! "In our increasingly pluralistic society, the school is the place where a peaceful dialog between varying views, values and religions and world views takes place and social competence in the contact with those who think differently can be learned. 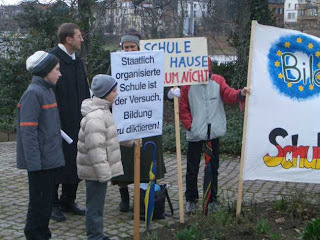 Homeschooling is therefore no model for Germany." An article appearing in the Frankfurter Allgemeine Zeitung uses Munoz' recommendation of homeschooling as evidence that he doesn't have a clue what he is talking about and has no business telling Germany how to educate its children. "If it were really important to Munoz to resolve the relationship between social origin and educational success, he could not recommend "Homeschooling" in which the selectivity would really be solidified, because a mixing of the social classes in the classroom would no longer occur at all." UN Report: Readers of this blog know I am no fan of the UN, and am not at all keen on the idea of ever signing the UN Convention on the Rights of the Child. But Germany has, which leaves them somewhat under UN supervision in education matters. The recent report by the UN (pdf, in English) presents interesting points of discussion for the issue of education in Germany. Among other things, Mr. Munoz recommends allowing homeschooling under supervision of the state, something which the State Ministers of Education have already rejected (in German). There is a discussion of homeschooling going on at the Spiegel International forum (in English). I was thinking about parallel societies today. We have a lot of them here in this country. Just think of the Amish, "Chinatown," "Little Italy," etc. In fact, earlier in our history (especially before WWI), large segments of our society spoke languages other than English. German was common here and was even the language of some schools and newspapers, Czech was spoken a few towns over and Swedish and Danish could be found just across the state line. There are still places in Kansas where you can hear "slop bucket German" spoken. This is merely my own personal opinion based on little more than my own observations, but it seems to me that when you leave a group to itself, it tends to assimilate on its own after awhile. It is coerced assimilation that gives rise to fundamentalism as groups perceive a threat to their identity, their religion, their social structure, etc. Lincoln has an ever-increasing Muslim and middle eastern population. We have numerous businesses owned by these families, some of which do not even have English signs on their businesses. I've shopped in some, which is an interesting experience. The labels are predominantly in Arabic, the shopkeepers do not always speak English all that well (but they have this cheese that is outstanding!) and you have to know what you want to be able to find it. I run into women with their heads covered frequently (and oddly enough, their children are aways dressed in American clothes). I have never seen, nor sensed the violence that is reported in Europe. Update 28: The Rome News-Tribune has published two stories (March 10, March 11) which highlight the case. (Thanks to Douglas Homeschool for the heads up!) Joel Thornton of the European Defense Fund, renamed International Human Rights Group, is from Rome, Georgia, and thus has attracted the attention of the local press. I am not familiar with this group, but have linked to their website. They also have a new page up with a picture of Melissa at the Clearingstelle (it sounds the equivalent of our visitation centers where families may have supervised visits with their children who are in protective custody), and a letter. This is shocking, but there must be more to the story or they would be getting all the homeschoolers. I wonder if they found some kind of abuse going on. Now they may lose their other five kids. I wonder if the parents are insane or something. Any thoughts from those home educating in Germany? While researching the article I wrote for Homeschool Enrichment, the basic answer I got was that Germany is a federal system and the way homeschooling is treated is not universally applied. In some states, it is a criminal offense, in others it is more akin to a traffic violation. Sometimes local authorities are aware of the "offending" parties but choose to ignore it for whatever reason. This appears to occur more in rural areas. Others are ignorant. Not all realize that when a family writes on their paperwork that their children are educated through one of various distance schools, that means they are home educating. Others are basically in hiding and even live separated from their families. And, once in a while, a family achieves approved status. Homeschooling also seems to be a more common choice among internationals living in Germany (such as Scatty and Sheila Lange). There appear to be about 40 cases in the courts, 7 or 8 cases slated to come before the European Court of Human Rights and a disputed number of those actually homeschooling (I have read estimates of up to 1000). The reported number of cases has been static for over a year. I don't know if that is still accurate or not. Conwebwatch has a series of articles criticizing WND and their reporting of the case. No real point in highlighting that, other than the bemusement at having blogs so dedicated to questioning other blogs. That is what I like about blogging...the site does not allow comments, but if you have any thoughts, feel free to leave them here. My intent has, from the beginning, been to provide as much information as possible so that the English speaking audience has some access to a broader range of information than what is available through WND and HSLDA updates. I actually agree with some of their points, but on the other hand, they didn't attempt to contact me to verify the validity of the disputed letter, either. If I had a way of posting it, I would. I suppose attempting to verify the story isn't the point of their article, but there are numerous sources available, many of which are linked throughout this entry. In fact, I think some of the statements of the state are in some cases more condemning of the German attitude toward what many here perceive as forced indoctrination than what even WND is reporting. I will point out that WND has toned down some of the Nazi connection in recent posts. It isn't a wholly inaccurate stance, but one which I personally think is a little misleading and not particularly helpful. This is a summary of the issue. Update 27: Spiegel International reports on the case. The article is in English and mostly reports on the American, conservative Christian response to the case. I would point out that while it is the conservative Christian groups in America which have most consistently reported on this story, there are others. And there are European groups which have shown considerable concern who are in no way Christian. This isn't a religious issue. The parents did not homeschool Melissa out of religious conviction, but because of Germany's highly segregated educational system, noted by one German as the most segregated in Europe. It has also attracted the attention of the UN (Update 23). Readers of this blog know I am no fan of the UN, but conservative American Christians are not the only people in the world who have criticized the German system (the UNs concerns have nothing to do with this case, but broader educational issues). If Melissa is unable to complete her work at the Gymnasium (highest level of education in Germany) and had gone to the Hauptschule (lowest level) as education authorities required/recommended with her expulsion, her chances for whatever future career she desired would have been severely limited. In reality, both naturally lie close together--the discontinuation of school attendance and the concern over the well-being of the child. Because in the conflict over school attendance of the oldest of the six children of the family, the authorities and the Youth Welfare Office found the parents to be extremely uncooperative. The attempt to have Amina escorted to school by police failed with the information that the child was in an undisclosed English-speaking country. The parents and child did not appear before a court hearing, but only the father. He refused to disclose the location of his daughter. You can read through the reports for yourself, but it seems to me that the first concern was when the parents began sending Melissa to school part time and homeschooling her in the subjects she had failed. The psych eval seems to indicate that part of the concern is that the parents and Melissa do not recognize that her "conditions of upbringing" are abnormal, and the only information really given is that she is homeschooled. I believe the interview being talked about in the article is this one, provided earlier by commenter Lena. 12 March 2007 - This morning, the OLG appeals court in Germany upheld the decision of the lower court against the Busekros family. The court also held that Hubert and Gudrun must undergo psychiatric evaluation. The family, while willing to do this to see Melissa returned home, genuinely fears that all of this will be used against them to take their remaining children away from them. An additional fear is that Melissa will be returned to the psychiatric clinic system in Germany and "disappear." This would leave the family with no way to know where Melissa is or how she is doing. She could become a ward of the State and completely lost to her family. The pressure on this family, which has been incredible for the past month, has just increased to levels that are beyond imagination. Please pray for their peace and wisdom as they continue to fight to hold their family together in this hostile environment. Someone also forwarded me a link to a German language forum from the city of Erlangen. I haven't had time to read the discussion, but it should be interesting and I may translate highlights after I've had a chance to read through it. Update 25: A letter from Melissa to friends in England has been posted to Netzwerk Bildungsfreiheit's website. It is in English. Is this factual? I'm no expert, but I know the Padeborner Baptists requested permission to form their own private school and it was denied on the basis that it was considered a front for homeschooling. Twelve Tribes was successful, at least for the one year probationary period which should be coming up soon. Have there been other instances where this has been allowed? Also, I'm only viewing this from afar, but it seems to me that Germany's private schools are not really allowed to be all that different from public schools. They seem very heavily regulated and monitored. Is that an accurate assessment? I am viewing this as an American...maybe even as a Nebraskan. At least; in this state, a private school can choose not to be accredited. Actually, homeschools here operate as unaccredited private schools. That absolves us of the necessity to conform to most of the state's requirements. Also, a couple of links. Helmut Boegelein, who I thought I already had linked to but overlooked it. He has a lot of information on the case. The View From Home explores some thoughts on parallel societies. This is the aspect of the German situation that intrigues me most. In a way, it is antithetical to the American "experience." But it also runs parallel to the ever-present socialization question. I believe it was Elizabeth who posted this on liberty.li, but one must ask, what is a pluralistic society but a collection of parallel societies? Robin's Readings and Reflections also offers a good summary of information. And thank you to my commenters who continue to post their thoughts and links, even as I have not had as much time to keep up with everything while my kids have been sick! Main criticisms in the UN report: The "extremely selective" effect of the German school system, the completely different school organization of the 16 states and the missing permeability between the school forms, the teacher training, too little autonomy of the schools in comparison to the administration. UN-Human Rights Inspector Munoz particularly criticizes the fact that in no other comparable industrialized nation does educational success depend so strongly on the social origins as in Germany. Frau Dr. Schavan, Germany's education minister, criticizes the report, claiming that Munoz misunderstands and misrepresents the German system. I cannot speak to the specifics, but I know that Andreas Hinz of the University of Hamburg has identified the German system as one of the most segregated in Europe. I actually attended the Integrierte Gesamtschule in Aurich (integrated comprehensive school). This is a sort of experimental school to address some of these shortcomings (experimental after how many years?) There are not too many of them, and when I was there, the IGS Aurich was the only one in East Frisia, with students traveling an hour one way to get to school. This is the original report. Update 22: Lena has offered some links to German language interviews related to this case. I have not listened to them, yet, but for those who speak German, you can follow the links from her comment. If I remember correctly, Netzwerk Bildungsfreiheit was spontaneously created last year in response to a complaint against human rights abuses of the German compulsory education system. Here is the original report, in English. And in German. The UN has finally responded. I will translate the press release today and post it. And a picture from last week's demonstration in Heidelberg. The sign says (my translation), "State organized school is the attempt to dictate education." Other signs said (my translation), "Homeschooling is a human right," and "We will remain homeschoolers." The large one (only part of it seen here) says: "Compulsory education instead of compulsory school attendance." Update 21: A demonstration for educational freedom is planned in Heidelberg to correspond with the arrival of the European Education Minister. For those who read German and have not yet heard this news, here is the press release. It is to take place Friday, March 2 from 9-18:00. You certainly do not have to be there the entire time, and it appears that the Education Minister will be leaving by early afternoon, so if you plan to attend, try to come in the morning. If anyone is able to make it, I'd love to hear from you. There is also an International Colloquium planned in April. How I wish Germany weren't quite so far away! However, anyone desiring to help German homeschoolers with their efforts to liberalize education laws in Germany may donate to the effort. I think this is a good cause, because it is helping homeschoolers work within their own country. On Netzwerk Bildungsfreiheit's homepage is a link to donate via PayPal or through their bank account (at the bottom). Also, the Washington Times published an op-ed piece by Paul Belien on Melissa's case. They also have commented on the case a few times recently on their site, The Brussel's Journal. Given the size of their audience, there are again a number of new blogs commenting on this case. Most are merely referencing what the Belien's have said. I've added some more links at the bottom of a few blogs which either contribute their own ideas or seem to have an interesting conversation going. Let me know if you know any other links that should be included. Welcome guests from WorldNetDaily. The letter referenced in the article is below under Update 16. I'm trying to keep this updated as much as possible, with links to a variety of sources and translations of what seems most appropriate. Feel free to leave a comment or ask any questions. A few homeschoolers from Germany have also been providing their insights and links to more information. Update 20: Helmut Boegelein has provided a very good translation of Dr. Schanda's medical evaluation. He also provides links explaining the classification disorders with which I was unfamiliar with. I guess you could compare it with my translation in Update 10, but I think I'd go with his. Update 19: Be sure to read Scatty's translation of the editorial appearing in the Nuernberger Nachrichten. If clearly spells out the underlying attitudes that German homeschoolers are fighting against. It also demonstrates what a difficult battle they will have without the support of the courts. For American homeschoolers looking on this with concern, there is a range of opinions on what, if any, effect these sorts of decisions will have on homeschooling in America. The opinion of the HSLDA is probably most well-known and most often circulated. National Home Education Legal Defense has also offered an opinion in their recent bulletin. Update 18: There is an American website dedicated to Melissa Busekros, with information about boycotting German products and contact information. For those who read German, an editorial was published in the Nuernberger Nachrichten regarding this case which exemplifies what I understand to be Germany's opinion of homeschooling. I will translate it later. Scatty has kindly translated it and posted it to her blog. It defends the state's actions, stating this is protection of a child's rights. And again, it has nothing to do with education, and everything to do with "socialization" and the ability of a child to develop his personality separate from his parents. Update 17: Scatty offers some further evaluation of the psych eval that was done on Melissa. She explains some of the codes that I was unfamiliar with and thus did not comment on in my translation. Contacting Melissa's Family: Netzwerk Bildungsfreiheit has added a guest book to their site so that you may leave messages to encourage the family. Don't worry about the language of posting. You will need to click the button that says: Neuer Eintrag (new entry). From there, I think it pretty self-explanatory, but here is the English, in case you are uncertain: Name (Name), E-mail (email), Thema (subject), Kommentar (comment). When you are finished, click "Eintrag speichern." This means "save entry." I really do try not to inject too much of my personal opinion into this. Mostly I desire to give readers as much information as I can on this case so that they can formulate their own opinions. I do wonder how this case would be if the parents were more conciliatory, but I am not even sure what that means. Is there anything the state would define as "cooperative" short of dropping Melissa off at school? Seeing as homeschooling is illegal, I doubt it. What exactly are the measures that the state has offered and the family rejected, thereby demonstrating how "uncooperative" they are? The following is a letter from the German Consulate to a member of a German-American organization's email. In keeping with my policy of not disclosing personal information of non-public figures, I am not including the recipient's name. It provides a good summary of the state's stance regarding homeschooling. Note that it has nothing to do with education and is all about "socialization." Studies indicating the success of homeschooling are irrelevant. To me, it also shows the direct connection to the perceived mental health issues of a homeschooling family, but that is just my interpretation. In Germany, the laws on mandatory school attendance are based on the principle of the government's traditional responsibility for providing education for the people. Mandatory school attendance was first introduced in Germany in 1919 under the constitution of the Weimar Republic to guarantee education for all, especially socially disadvantaged families. Then and now, equality is seen as an important democratic ideal. You may be aware of the fact that schooling in Germany is generally free of charge. Article 7 of the Basic Law of the Federal Republic of Germany (the German constitution) places the entire school system under the supervision of the government and ensures that the government makes education available to every citizen. Homeschooling may be equally effective in terms of test scores. It is important to keep in mind, however, that school teaches not only knowledge but also social conduct. Daily contact with other students from all walks of life promotes tolerance, encourages dialogue among people of different beliefs and cultures, and helps students to become responsible citizens. The public has a legitimate interest in countering the rise of parallel societies that are based on religion or motivated by different world views and in integrating minorities into the population as a whole. If we are to achieve integration, not only must the majority of the population prevent the ostracization of religious minorities or minorities with different world views, but minorities must also remain open and engage in dialogue with those who think differently or share different beliefs. Such a dialogue with minorities is not only necessary but also enriches an open, pluralistic society. at public schools; however, it is offered to those who decide to select it as a subject. I hope this explanation is helpful to you in better understanding the German system of mandatory school attendance. Update 15: (2/21/07) Sorry this took a little longer than expected. The court report does not actually say very much, other than that all previous findings are to be upheld, a new specialist is to be ordered and the parents are uncooperative. There is some other interesting information, as well. If you read German, here are some links. I haven't done more than skim them yet, but will provide summaries later if they seem interesting or give any new insights. A report from the Nuernberger Nachrichten, with a little more of a history of the case. Another story from kreuz.net. From what I've skimmed, it looks to be a summary of the court decision. And one more story from kreuz.net, that I don't think I linked to before. I have my opinions of the court document, but I'll let you read it and decide for yourself. My insertions, explanations or notes on translation difficulties will be in brackets. For those who do not, Crosstalk aired another program involving this case (February 15). This program includes an interview with Melissa's father. 1. The findings of the district court of 2/1/07 are being maintained. 2. The expert Dr.---[who wrote the psych eval] is released of the duty of constructing the youth-psychiatric evaluation of the endangerment of the child's well-being. 3. To formulate a youth-psychiatric expert evaluation to answer whether M. has a severe emotional disturbance and which measures should be followed, the expert ----- is assigned. 4. The following expert is entrusted with the duty of writing a family psychological evaluation in order to determine the child-raising abilities of the parents, Gudrun and Herbert Busekros. The parents and Melissa are to be included in the evaluation. It is based entirely on the grounds of the findings of 2/1/07. 1) The Youth Welfare Office of Erlangen presented a report from 2/15/07 and requested the upholding of the findings and a family psychological evaluation of the upbringing-capability of the parents. 2) The expert Dr. --- was personally involved, and gave his professional opinion. 3) The parents were personally involved. 4) The child was personally involved. 1) The court is convinced that the measures taken for the well-being of the child at this time ust be continued in their entirety. The relevant diagnosis has been reinforced by the explanation of experts. Melissa suffers from more than a school phobia. This is more likely a result of a severe emotional disturbance. The expert depicts M. as a very needy child whose self-esteem problems stand at the forefront. The proportion of the measures struck are warranted. The duty of assessment was given immediately by the court, after which up to now only a provisional professional position in the form of a brief evaluation is present. The psychological testing hasn't been done. After the child declared herself ready to cooperate with the evaluation in conversation with the experts and the psychologist, she resisted further testing after conversation with the parents. The parents have agreed to the testing on 2/16/07, but insisted on the institution of another expert. An amicable agreement, as proposed by the court, failed due to the missing agreement of the parents. It cannot at present be determined conclusively whether M. needs long-term in-patient treatment or whether out-patient measures will suffice. This can only be determined when the evaluation is complete. The court is of the opinion in these proceedings that the child's continued care in the current therapeutic measures until the completion of the final evaluation is urgently required for the child's well-being. This is especially true since the parents have negatively influenced the child with respect to the evaluation. A milder measure is not apparent at this time. 2. The court has given the responsibility of the evaluation to another expert. It became clear that the parents were not ready for any kind of cooperation with the experts assigned up to now. With this situation exists substantial considerations whether the appraisal--so far as it is done by the previous expert, whose general knowledge resulted in no doubts for the court--can lead to a pacification and the urgently needed cooperation with the parents which is necessary for the well-being of the child. The family does not know where Melissa is and has reportedly already had to move from her first foster family. The family may visit her once per week in Wurzburg which is 100 km from where they live. There will be new specialists assigned to the case and the evaluation translated in Update 10 is to be disregarded. The other children may be evaluated, as well. I received the court document after midnight and will translate it later. I will post it in its entirety, save names and addresses of those involved and highlight any discrepancies between what has been said as speculation up to this point and what the report actually says. -Melissa can't go home. It seems Judge decided she has to stay in a shelter. - the JUGENDAMT is obviously threatening to move Melissa from one shelter to another again and again and again if the parents (and all friends of the family) don' t stop the campaign "FREE MELISSA"
I'm sorry to not be able to provide more information at the moment, but will translate what I find this evening. Waiting for news: Here is the link to the transcript of the original psychiatric evaluation done on Melissa. Comments from another person in the field are inserted. I will translate them an add them to the update below, hopefully tomorrow. The comments are translated below (update 10) and are presented in purple. Here are some selected letters sent regarding this case. And please don't miss Scatty's psychological evaluation of the German authorities. I award her an Honorary Doctorate in Bureaucratic Studies. There appears to be another case developing that I may blog about, especially if anyone is interested. I'll let you know once I've had a chance to read what I have and catch up a bit on the case's history. The parents of (Amina/Melissa) now know where their daughter is being kept and can visit her anytime. Regarding the court's decision: It is now after 6PM in Germany, if my time converter is correct, so if the court ruled, the decision should be known. Thanks for the update, commenter scatty. It appears the deliberations went on for awhile, and a decision has not yet been given. It reportedly will be delivered in writing, I'm assuming possibly not until Monday? I am getting ready to take my children on a homeschool field trip, so will be gone for the afternoon. If anyone hears what the decision is, please feel free to leave a comment. This entry is getting a lot of visits this morning, and I'm sure most are interested in how the court ruled. Lena also left a link to a little paper from the Erlangen area which also talks about Melissa's case. It is in German, but what I have read so far is very interesting. Update 11: Melissa's family has court tomorrow (Friday), possibly at 4PM (10AM EST) 11AM (5AM EST). Demonstrations are planned in the Erlangen area. I will post an update as soon as I know what happened. Update 10: This is the psychological evaluation that was done on Melissa Busekros and will be submitted to the court on Friday. It is lengthy, but I think it is of benefit to translate as much as is possible. It is not an exact translation. (There are a few sections which did not fax clearly and thus are difficult to make out. My insertions, explanations and guesses will be in brackets. Also, I am not a psychologist and am not able to adequately translate specialized language.) Update: In purple are the translated comments of an independent expert in Germany who evaluated this report, but desired to remain anonymous. Melissa B. was discharged from the Christian-Ernst Gymnasium in Erlangen on 02/28/05 because she attended school only very selectively since September 2004, after she failed the 7th grade and was set back to the 7th grade. Even after the Bavarian VGH upheld the lawfulness of the discharge on 12/18/05 and after [assignment to the responsible parish school? ], M. refused to attend school. The father of Melissa and Melissa herself view themselves as victims of misunderstandings and slandering from the school and the Youth Welfare Office. M. reports that school "went very badly" and she couldn't handle the school situation. She reported further that she participated in many school activities but declined to give details. The mother reported in a telephone conversation that she had been discontented with the school situation. She had attempted to [type blurred...guessing catch up] in the seventh grade but was overwhelmed with the amount of content. The father reported in a telephone conversation on the afternoon of 1/30/05 that he was sure M. would begin her studies [university] in Summer 2008, because she had caught up on a lot of the content. He himself rejected further regular schooling. The father reported further that he would demand the return of M. to her old class at the CEG. The father sees himself as a victim of state arbitrariness [could be translated as despotism, but I think the sense is more that he is at the mercy of the state] and he will defend against the regular schooling of M. He could only with difficulty imagine an enrollment in the KJP Erlangen school for the sick. The father could not discuss the emotional situation of M. and sees absolutely no endangerment of her emotional development. At first contact, M. was alert, oriented, quiet and somewhat reserved. M. presents herself affectively as indifferent, her drive and psychomotor movements were inconspicuous [I believe the point is that there is no concern in this area], thinking and perception are not greatly disturbed. M. appears in person unapproachable, appeasing, her willingness to cooperate did not seem genuine. Her mood tended toward depressive, the ability to transition was markedly reduced. Overall, M. appears very unhappy, as if at a dead end. In summary, the current clinical-psychiatric finding shows that M. has an emotional disturbance which is connected to a massive school phobia and a strong self-esteem problem. Not tested. At first estimate: normal intelligence. What are these supposed to be? Reasons, further proof? No evidence is provided. Serious and universal social impairment in the area of school adjustment and school related interests, pass times and the ability to cope with social situations. During the conversation we were able to confront Melissa with her situation. On the grounds of her massive school-refusal, the emotional disturbance and the unsatisfactory willingness to cooperate on the part of the parents, a relocation to a therapeutic home/group home is urgently required in order to avoid endangerment to the development of her personality. The question arises, How can I urgently recommend requirements if I haven't tested where gaps are. With what does the evaluator verify his assertion that M. can even manage the goals without testing? Melissa Busekros was examined by us. She suffers an emotional developmental disturbance, a massive school phobia and an oppositional denial-syndrome. Melissa does not agree with the treatment and sees herself as healthy and her behavior as fully normal. M. needs urgent help that can only be provided in a closed environment and subsequent therapeutic care which will ensure her schooling. Because it is not possible for the parents to understand the endangerment of their daughter properly and make the necessary decisions regarding her further development or the type and length of the treatment and the schooling, the responsibility for her residence, care and representation before officials should rest with the Youth Welfare Office of Erlangen. By reason of these findings, from this point on it must be assumed that the child's well-being is endangered and also the conditions for a stationary accommodation in a therapeutic arrangement must be made. By reason of the severity of the symptoms, she can only be provided stable and dependable contact to others her age and adult care-takers as well as the development of Melissa's very limited ability to cope with stress in such accommodations. M. does not have the capacity to lead a self-determined and self-structured life as she would like. The necessary measure is to prevent a considerable endangerment to her further physical and emotional development which can occur only in a therapeutic environment, since experience shows that she will retreat from other measures. M. needs additionally competent child and youth psychiatric care and guidance that could be attained in such a situation. Here, outpatient measures are suggested, further above, inpatient treatment is urgently recommended. The contradictions are obvious. I find the evaluation very weak, both in regards to the case history as well as in regards to the findings. With the case history, the conduct and the subjective situation of the child in regards to a "disturbance of the social conduct with depressive disturbance" is hardly explored. Also the psychopathological finding is, for an evaluation, much too lacking and barely differentiated. Supplementary findings (checklists of symptoms, personality inventories or computer generated achievement diagnostics) are completely missing. A "disturbance of the child's age, massive school phobia and an oppositional resistance syndrome" with "strong self-esteem difficulties" (in another place: "emotional disturbance of the child-youth age, which is connected to a massive school phobia and a strong self-esteem problem") can not be deduced on grounds of the presented case history and psychopathological findings. The use of diverse diagnosis appears unclear and inconsistent. Despite the shortcomings, colleagues think they have determined an endangerment to the child's well-being on the basis of their findings. The child is supposedly one year behind in her emotional development. The evaluation presumes a claim which cannot be made on the basis of the presented findings and case history. Update 9: It looks like Melissa and her family will have a court date on Friday. She is apparently still in the Nuremburg area, but exactly where is not known. Further information: Germany's Youth Welfare Office has been brought into question and a petition for its dissolution has been filed with the European Parliament. This has nothing directly to do with this case, but deals with a long history of abuses by the German Youth Welfare Office. This site provides more information (in English). Update 8: According to the parents, Melissa has been moved from the clinic to an undisclosed location. They were not given a reason for the move and do not know where she is. The lawyers are horrified and are recommending charges be brought against the Youth Welfare Office for removal of her freedom and kidnapping. A call to the office of the CSU party leader, Joachim Hermann (contact information below) revealed he knew of the case and would do something but gave no further details. Personal Commentary: (Just my observations, take them for what they are worth and feel free to add your own thoughts!) While reading about homeschooling in Germany, there have been three cases which I spent some time researching: this one, the case of the Roland family and the case of the "Padeborner Baptists." The other two families homeschooled for religious reasons, which is not very accepted in Germany. It is continually portrayed as a borderline cult activity. As I read through the commentary and forums on the two older cases, most of the people who commented supported the state, believed homeschooling should be illegal and cited reasons such as the development of "parallel societies" and other arguments similar to Germany's arguments in the Konrad case. This case seems different. My view is admittedly limited, but all the comments I have read seem to support the family. Some of that support is tentative and desiring of more information, but the tone is much gentler and sympathetic. I think the Busekros family chose to homeschool for a reason that almost every German parent can identify with: they did not want their daughter held back or forced into a Hauptschule, the lowest level of secondary education, where her later career chances would be severely limited. Also, as I've noted before, Germany tends to be much more liberal in its views than we are here in the US. In at least one case, a German court has rescheduled a sentence to accommodate a nursing mother. Separating families and particularly arresting mothers is not something I have ever imagined that most Germans will accept over a period of time...and the forced internment of a child in psychiatric treatment is certainly more state aggression than anyone I have ever spoken with would tolerate. Especially if the state's reported reasons are accurate: school phobia and being one year developmentally delayed. Update 6: CBN reports on the case (in English). According to the father, numerous letters have been received by the clinic where Melissa is staying, but she is not receiving them. kreuz.net interviews the father (in German). I will translate it tomorrow. Her stay in the hospital is supposed to last one week. Hopefully she will be released shortly (Friday). I don't know officially when the court is supposed to decide. Update 5: The Evangelische Nachrichtenagentur releases a story (February 9, 2007) Not a lot of new information. It provides a summary of the situation, and goes on to discuss how home education is internationally recognized and this affects up to 500 families in Germany. Perhaps unclear in other reports, this one cites that Melissa was sent overseas to Australia when the pressure from the school authorities began to increase. (Thus she was unable to appear at the first court date). According to the court, the father gave false information about the daughter's return date, which the father denies. 1) The Youth Welfare Office has the responsibility to intervene when a youth is endangered, physically or psychologically. The first step is to clarify the circumstances which is occurring in the clinic. 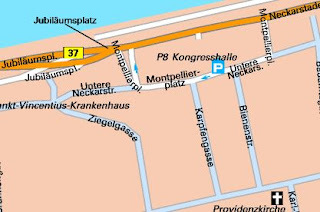 2) The temporary housing of the girl is a consequence of a decision of the family court in Erlangen. It was considered urgent to evaluate the circumstances of the girl. 3) The decision has nothing to do with a no-longer-binding compulsory attendance law. 5) The Youth Welfare Office can not comment on the details of the case due to privacy issues. 6) The welfare of the child is the central concern in the actions of the Youth Welfare Office. Together with the family court, and after collecting the necessary evaluations and with the inclusion of the mother, the father and the siblings the Youth Welfare Office will do everything possible to come to a solution that serves the well-being of the child. Clarification: There appears to have been some miscommunication somewhere since both HSLDA and World Net Daily (and consequently half the English sites commenting on this case) are reporting that Melissa is 17. She is 15. Update 3: The Nuernberger Nachricthen reports on the case. This report is more personal and describes the family's visit with Amina (Melissa). She is pale, walks slowly and slumped and says she wants to go home because it is so boring. She begins to liven a little when her sister begins to play a game with her she brought from home. An attendant reminds them sharply that only a brief visit was agreed upon, in order to drop off a few school things. I may translate the rest later. Update 2: It looks as though Melissa is to be released at the end of the week. However, since custody now rests with the Youth Welfare Office, it is not clear whether she will be returned to the care of her parents or other caretakers. Joachim Hermann is the CSU party head and Erlangen's state parliament delegate. He knows Mr. Busekros personally from multiple conversations. Update 1: February 7, 2007. The Erlanger Nachrichten (a local newspaper) reports on the case in a report titled (my translation), Terror from the Youth Welfare Office and the Courts? (in German) The father expresses his anger, calling those responsible for the removal of his daughter a "state terror group." He says he plans to take the case before the European Parliament and demands the return of his daughter and consequences for those involved in her "abduction." Background: Press Release from Netzwerk Bildungsfreiheit. David's Medienkritik responds, more through discussion in the comments.